Amy is never ill, let alone sick, so seeing her as exhausted and lifeless as she was yesterday and still is today was and is just heart-breaking for me. Stomach bugs are doing their rounds in Bristol at the moment and as Amy’s cousin Grace is also ill, it wasn’t a surprise that Amy caught the bug without even seeing her. Amy woke up her usual happy self yesterday, but after having breakfast, she ran towards me and vomited right in front of my feet. I didn’t think anything of it and thought she might have just had too much to eat, but ever since she started being sick yesterday morning, she’s been vomiting. I feel so sorry for my little girly. She’s so good about it all though and really tries to put on a brave face. She was even sick and tried wiping it away with the kitchen towel that I had ready in the living room. Bless her. I told her that it’s fine and that mummy will wipe it all up, whereupon she looked at me with her big blue eyes, gave me a little smile and cuddled back up on the sofa where she snuggled with me all day. Unfortunately, she was still feeling poorly in the evening and kept being sick in her sleep, so we decided to take her up to Bristol Children’s Hospital to get her checked through. As soon as we stepped through the door, she (surprise, surprise!) stopped vomiting and went back to her usual happy self. We stayed a while in an attempt to catch a wee sample (we failed miserably) and gave her some Dioralyte to rehydrate her little body. Luckily, everything stayed down, so we were discharged around 3.30am in the morning and made our way home. 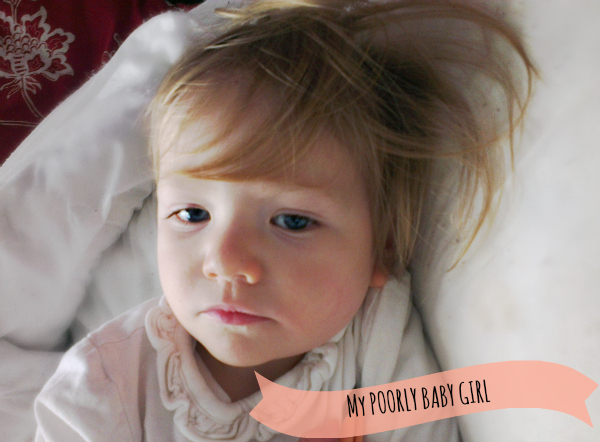 We had an uneventful night, but my little lady is still poorly this morning. She’s been alseep on the sofa most of the day and when she was awake, she snuggled up to me. It’s lovely to get lots of cuddles from her, especially as she’s usually a little whirlwind and always on the go, but I’d rather see her racing around the house and jumping on windowsills than curled up on the sofa. Get well soon, baby girl! Hello! Just found my way here for the first time. Poor little Amy, I hope she gets over the bug very soon. We've got all of this to come, our boy's only 9 months but I'm already dreading the tummy bugs he'll catch!